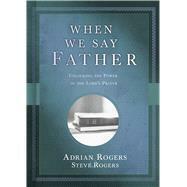 Adrian Roger's last written manuscript before his passing in 2005, has been edited and brought together by his son Steve, as a final joint work. When We Say Father takes the Lord's Prayer and breaks it down to its most basic components for readers to easily learn how to pray from the ultimate source, Jesus himself. Adrian Rogers (1931-2005) was one of America’s most respected Bible teachers, communicating to millions through his Love Worth Finding radio and television ministry that continues today. He was also senior pastor of the 27,000-member Bellevue Baptist Church near Memphis, Tennessee, and a popular author whose books include Unveiling the End Times in Our Time, The Incredible Power of Kingdom Authority, and What Every Christian Ought to Know. Steve Rogers is the president and co-founder of the Adrian Rogers Pastor Training Institute, headquartered in North Palm Beach, FL. Steve is a well-known author, songwriter, and speaker. Along with his father, Adrian Rogers, Steve is the coauthor of three Broadman & Holman releases—What Every Christian Ought to Know, Family Survival in an X-Rated World, and Unveiling the End Times in Our Time. Steve also writes a monthly column (now in its fifth year) named Life Well Lived for Mature Living magazine (published by LifeWay). Steve has been married for forty-two years to his childhood sweetheart, Cindi. As natives of Florida and current residents of North Palm Beach, Steve and Cindi love to be around the water, and are active in kayaking and stand-up paddle boarding. Steve and Cindi have one daughter, Adrienne Renae, who is married and lives in California. They have a grandson, Townes, who is seven years old.